Idaho Nonprofit Center’s membership director Richard Mussler-Wright has an unusual passion. INPC is a statewide association dedicated to helping nonprofits realize their goals and those of the causes they represent. “We help them to strategize. We help them to plan and think about how they’re going to effectively and efficiently approach their mission,” Mussler-Wright said. But there are a number of issues that affect every nonprofit, such as caps on charitable donations and dealing with state contracts. He’s been on a statewide tour, most recently visiting 15 nonprofits from Mountain Home to Idaho Falls. Nonprofits can range from human services such as shelters and food banks, to historical societies and art museums, to animal protection societies and more. When Mussler-Wright is not working, he plays—with Legos. He’s been working on dinosaur Lego creations and teaches a series of engineering camps including robotics. “Lego is a wonderful thing to share with kids,” said Mussler-Wright. He designed curriculum that helped kids love science and helped install Lego labs and others, such as Erectors, in science and technology labs in schools and after-school environments such as Boys and Girls Clubs. He’s also involved with the Arduino community, which works with robotic controllers. They’re cheap, and the systems cost fractions compared with others. Thanks to that low price point, kids are developing robotics formerly only available for scientists and uber-electronics geeks, he said.His own children also benefit from his desire to teach and play. Mussler-Wright lives in Boise with his wife Marlene, his 12-year old daughter, and his 8-year old son. 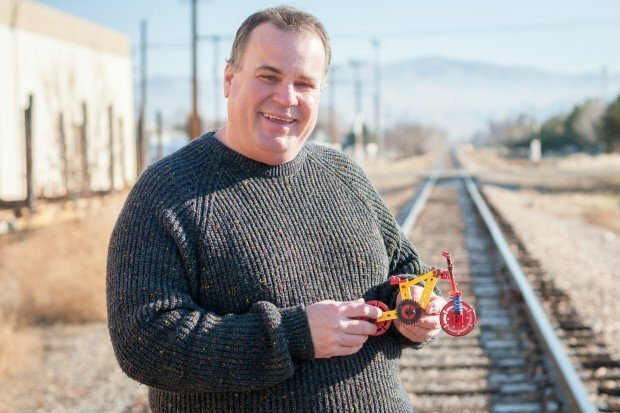 An avid bicyclist, he commutes about 10 miles a day to work, and created a “circus train” with his kids when they were younger. From work to play, Mussler-Wright has built a meaningful life that helps others.